Vietnam is fast becoming one of the most romantic and fascinating destinations in Asia. Plan a most unforgettable and extraordinary honeymoon or wedding anniversary celebration in our country. Sapa, located at the foot of Mount Fansipan, is known as "the city in the clouds" and has been named the most attractive destination in Asia due to its pure air, spectacular scenery and vibrant H’mong-Dzao culture. 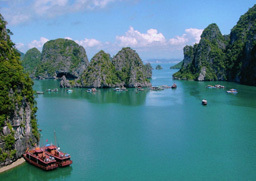 Halong, is yet another natural wonder and has been recognized as a World Heritage Site. You and your partner will enjoy and admire the spectacular seascape of Halong Bay while cruising by its otherworldly karst formations and spend a night on an elegant, wooden junk. Plan your most unforgettable and extraordinary honeymoon or wedding anniversary celebration in our country . Explore Sapa, town of love and romance. Admire the spectacular landscape of Halong Bay. Taste Pho,a noodle soup considered Vietnam’s national dish. Upon arrival at Noi Bai international Airport, our guide and driver will warmly welcome and transfer to hotel for check in. Then you are free & easy till the evening, when a romantic dinner for two will be served at a local restaurant. Overnight in Hanoi. A day of sightseeing starting with the Ho Chi Minh Memorial Complex, Ho Chi Minh's stilt house, the One Pillar Pagoda, West Lake, Tran Quoc Temple and the Temple of Literature before enjoying the delicious lunch at a local restaurant. The Women’s Museum, a walking tour through Hanoi's Old Quarter with its 36 themed streets, coffee at a local café, and a visit to Ngoc Son Temple will make up your afternoon program. In the later afternoon, you will enjoy the delightful water puppet show, then transfer to the railway station for the night train to Sapa. Arrive in Lao Cai around 06:00am, and drive straight to Sapa. You will have breakfast on the way at a local restaurant. At the check-in to your hotel, a basket of flowers will be waiting for you in yourromantically decorated room. Explore Sapa town. In the afternoon you will hike to Cat Cat Village inhabited by the Black H'mong tribe, and splash around in a nearby waterfall. Continue toward Sin Chai, another Black Hmong minority village, which is located right at the foot of Hoang Lien mountain range. Rturn to the hotel in the afternoon. Breakfast at the hotel followed by a full day tour of Sapa starting with its vibrant market and colonial houses. Descending into the Muong Hoa Valley, you will reach the picturesque Lao Chai village of the Black H'mong ethnic minority and Ta Van village inhabited by Dzay. Enjoy stunning views of rice terraces curving around the hillside and winding rivers and streams glittering in the sunshine. Picnic lunch will be served before visiting the Ma Tra village, home to Black Hmong ethnic people on the way back to Sapa. After breakfast, drive by private car to Bac Ha to visit Bac Ha market. This is the biggest local ethnic fair, which is held every Sunday. Tribal people from surrounding villages flock here to exchange their products. Most still use horses to carry their loads, so they have to depart very early to reach the market in time. If you happen to be in Sapa during a spring weekend, you will frequently meet locals in their colorful costumes heading down to the markets, as this is the time to find a marriage partner. For youngsters, this is a wonderful chance to travel around and find a darling. 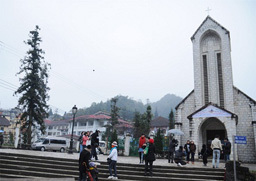 Spring in Sapa, especially around Tet Holiday (late January to early February), may be very cold but not at all gloomy. This is the flirting, dating and wedding season. Nature also adds to the vibrant atmosphere with red and white blossoms blooming everywhere. This spectacular scenery cannot be found anywhere else. After lunch, you will leave the colorful market behind, to follow a zigzag road along the mountain to visit Ban Pho 1 and Ban Pho 2 villages, inhabited by Flower H'mong people. 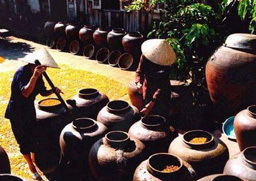 Stop at some local housesto see how they make corn wine, a special wine Bac Ha is renowned for. Taste some and you will truly feel its local flavor. Head to Lao Cai train station for the night train to Hanoi. Arrive in Hanoi in the early morning around 05:30am, where the guide will pick you up at the station and bring you to a 2-star mini hotel to freshen up and have breakfast. 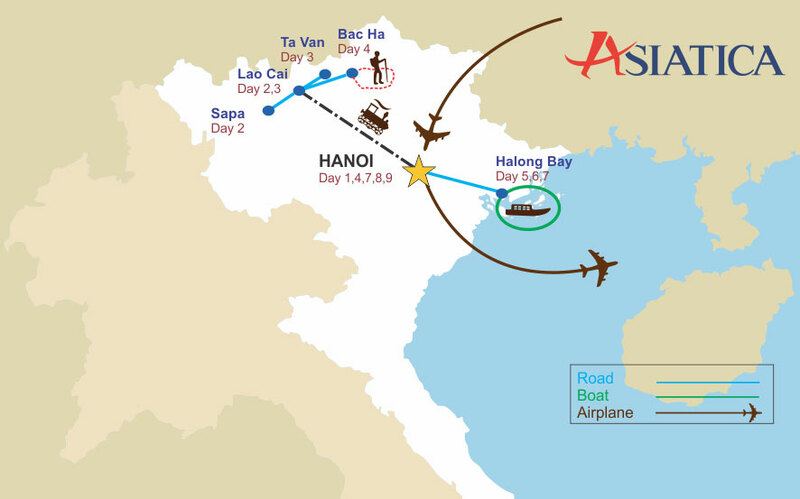 Then start a 3.5-hour drive through the Red River Delta to Halong, 180km from Hanoi. There will be a few photo and coffee breaks en route before arriving in Halong. You will embark a refurbished wooden sailing junk for a cruise past limestone cliffs emerging from the emerald waters of Halong Bay, giving you the chance to take in the stunning scenery of this World Heritage Site. On board you will be served a sumptuous fresh, local seafood lunch followed by a swim and exploration of some of the limestone caves in the area. When the sun goes down the junk will drop anchor for the night nearby a remote island. Aboard the vessel, surrounded by this stunning seascape you will attend our Vietnamese cooking demonstration on the sundeck. Explore Surprise Cave (Hang Sung Sot), one of the largest and most famous grottoes in the entire Halong Bay. Check-outof your cabin and settle the bills. Arrive back at Halong pier, disembark and meet your driver who will take you back to Hanoi. Overnight in Hanoi. You will be taken to the airport for your departure flight. Asiatica Travel’s services end here. discover the Hanoi’s way of life. 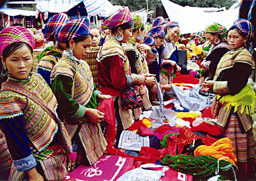 watch ethnic minority people exchange goods. 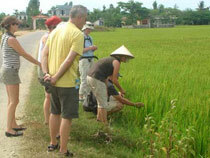 cooking demonstration visit one of Vietnam’s World Heritage sites, enjoy fresh sea foods. free day until departure flight.